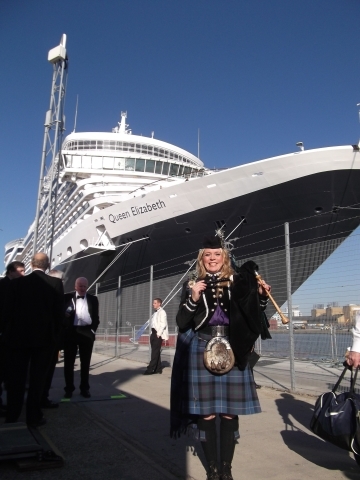 I was completely honoured to perform for Her Majesty The Queen at the naming ceremony of Cunard's 'QUEEN ELIZABETH' ocean liner in Southampton, 11 October 2010. Performing 'Amazing Grace' alongside top Soprano Lesley Garrett, The Bournemouth Symphony Orchestra and Chorus, with Britain's top Conductor, Anthony Inglis was an incredible experience. 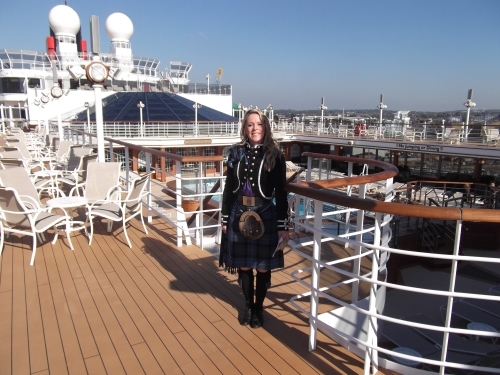 I had an amazing time staying on board and met so many lovely people. 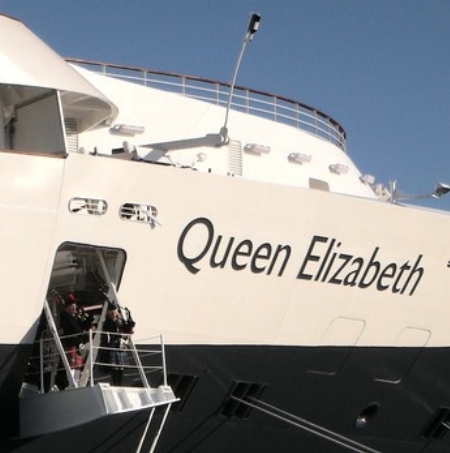 The 'Queen Elizabeth' is in a class of it's own! 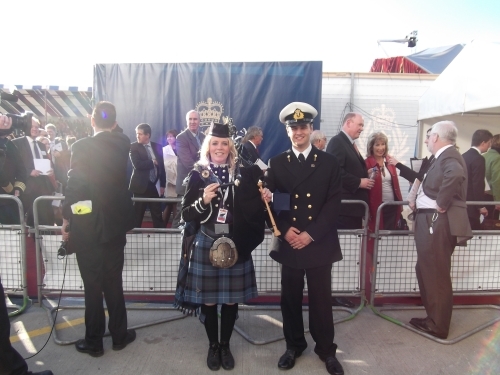 Here are some pictures of my time on board and during the naming ceremony in Southampton - enjoy! 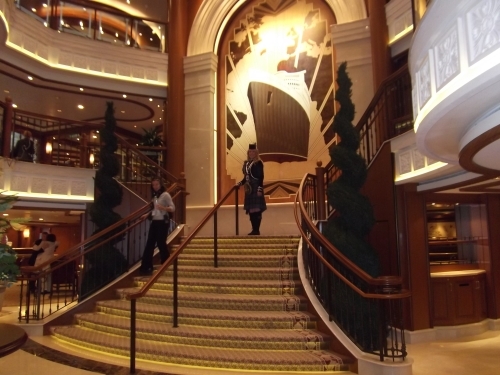 Cunard's wonderful QUEEN ELIZABETH Ocean Liner! 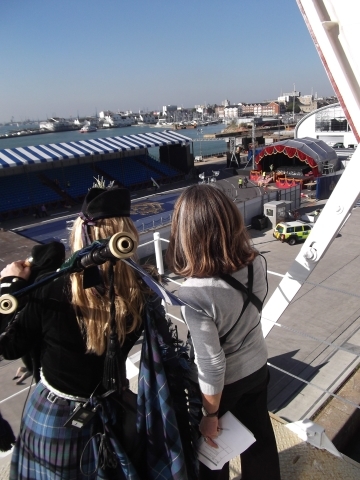 Performing at the naming ceremony, Southampton, 11 October 2010. 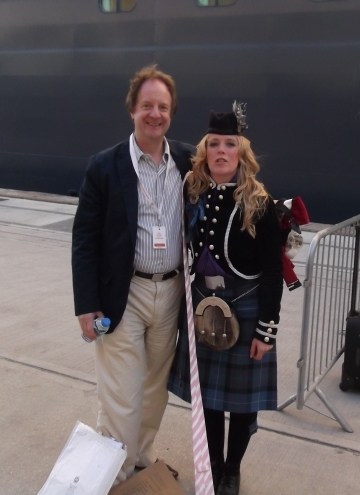 Anthony Inglis and I - about to board the 'Queen Elizabeth'! It was an absolute honour for me to perform alongside one of the world's top conductors. 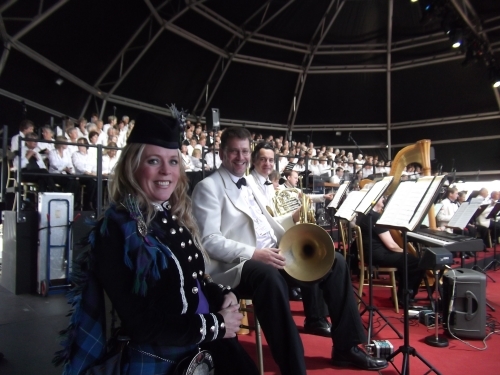 The Bournemouth Symphony Orchestra and Chorus! During rehearsals - the day before the naming ceremony! The Bournemouth Symphony Orchestra during rehearsal! They are absolutely incredible - conducted by top British Conductor Anthony Inglis. 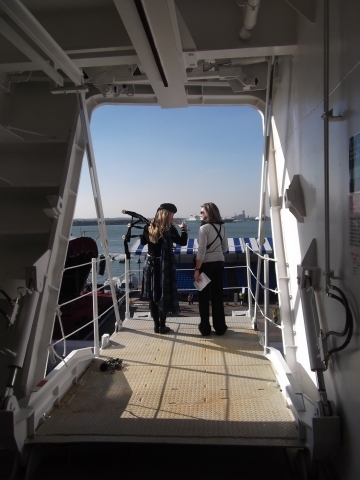 On the mooring bridge of the Queen Elizabeth during rehearsals with wonderful Kate, from Robbie Williams Productions! This is where I was located when playing with the orchestra! Looking down to the main arena where the orchestra and bands were rehearsing. Looking at the stage where Her Majesty will name the 'Queen Elizabeth'! The day before the naming ceremony! You can see the band of 'The Coldstream Guards' and 'The Scots Guards' marching in the arena! What an atmosphere! 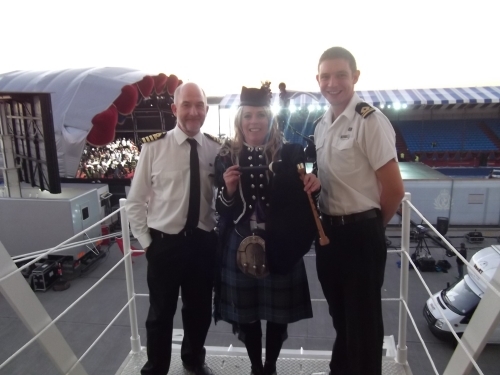 Pictured here with Officers from the QUEEN ELIZABETH! during rehearsals! Just before we visited The Bridge! Sitting in the Captain's seat on the Bridge! I think one of the Officer's wearing my hat looks a bit worried! 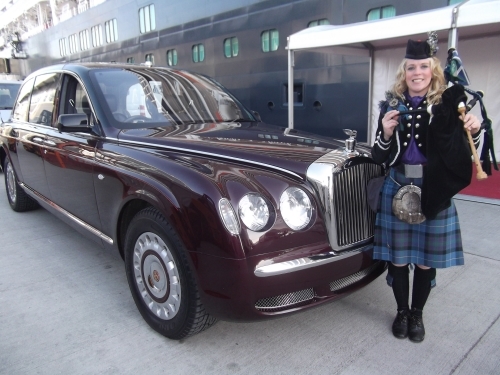 Pictured here with Her Majesty The Queen's car. 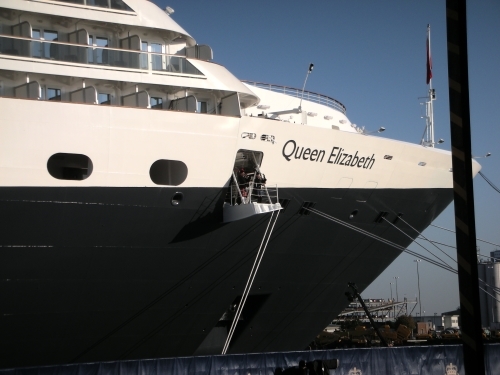 If you look carefully, you can see Her Majesty the Queen boarding the 'Queen Elizabeth'! 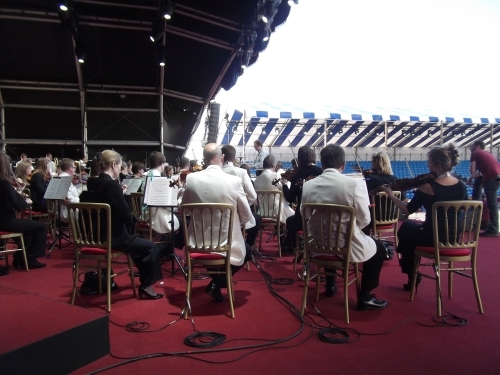 As the Bournemouth Symphony Orchestra and Chorus perform adding an amazing atmosphere for the arrival of Her Majesty, prior to my performance. Portrait of Her Majesty The Queen by Isobel Peachey. In its new home - a prominent position in QUEEN ELIZABETH's Grand Lobby! Pictured here in the Grand Lobby! In front of the stunning marquetry piece of art work, created by Her Majesty's nephew Lord Linley. 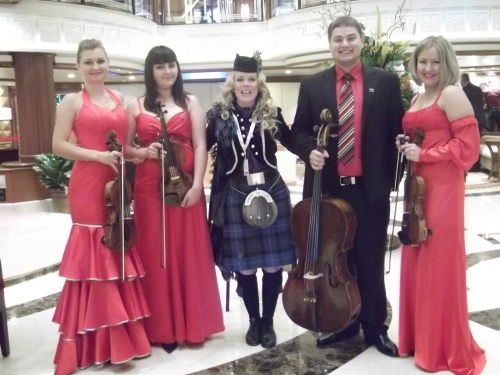 A photo of the amazing string quartet! Pictured here with TV Presenter Carol Vorderman! Along with Paul Young from the Coldstream Guards! 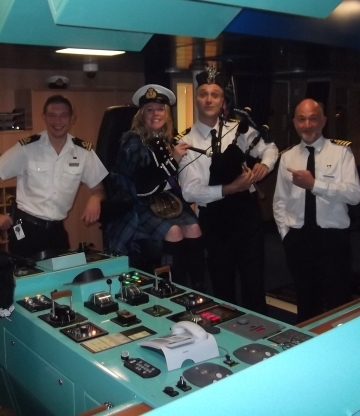 We had a fab time on board! It was such a gorgeous day - I really felt like jumping in! 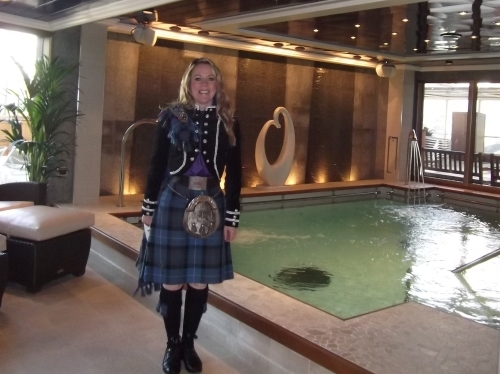 A photo of me when I popped into the Spa! 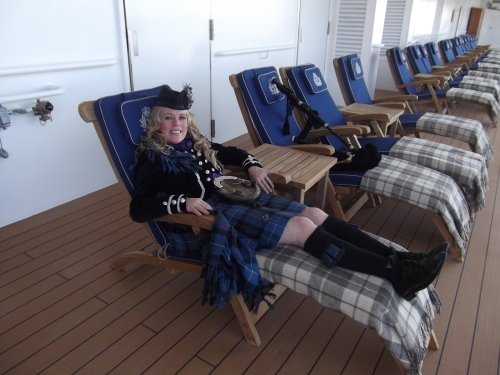 Enjoying the sunshine on the open deck of the QUEEN ELIZABETH! 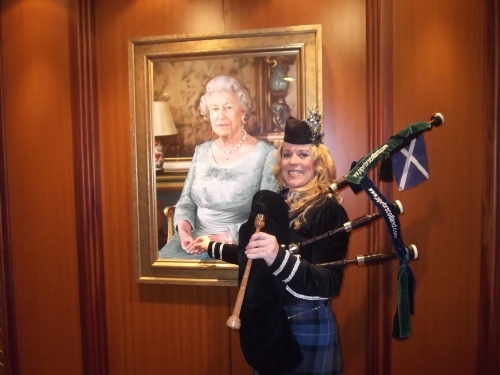 And here we are performing for Her Majesty The Queen at the naming ceremony! 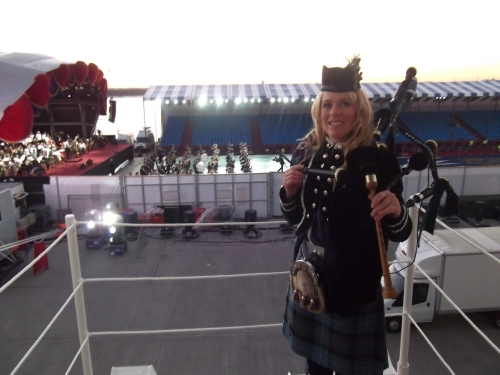 Paul Young, Piper from the Coldstream Guards and I performing 'Amazing Grace' alongside the Bournemouth Symphony Orchestra and Lesley Garret. If you look closely you can see the bottle of wine sitting above my head prior to the naming of THE QUEEN ELIZABETH by Her Majesty The Queen! I am so pleased they got the timing right when the botte came down! 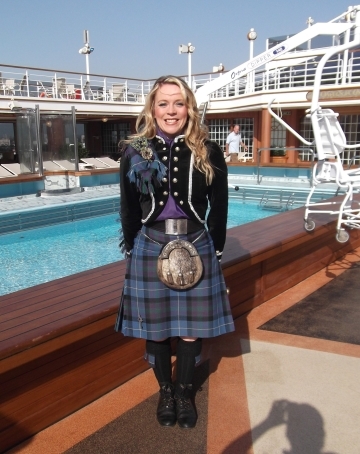 At the end of the naming ceremony of QUEEN ELIZABETH! As guests leave the arena! 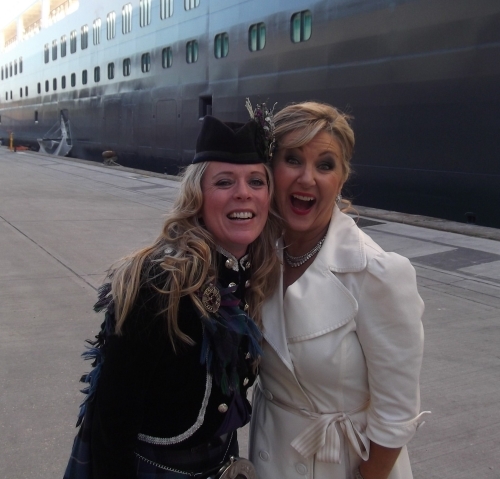 Top British Soprano, Lesley Garrett and I! 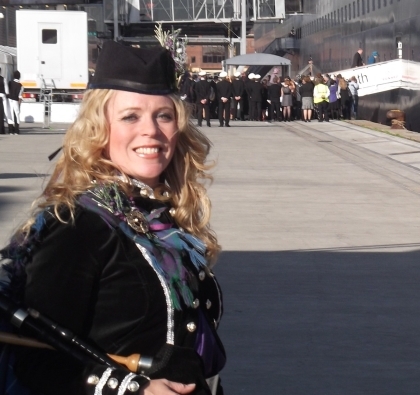 After we performed 'Amazing Grace' together during the ceremony.